With Hitachi Performance Starters, rest assured your getting the best "true" mini-starter there is. Pit Stop USA is The Online Motorsports Superstore! We feature Hitachi Pro Racing Starters. When you choose Hitachi, you are choosing the best. Nobody has Hitachias OEM experience and technology. Some of the largest car manufactures in the world depend on Hitachi starters to start their engines. All that engineering know-how is now available to every consumer wishing to step-up to Hitachi quality. With Hitachi Performance Starters, rest assured your getting the best "true" mini-starter there is. All are 100% new and manufactured to the highest OEM specifications.The Hitachi Enforcer Starter is the latest Hitachi Pro Racing Starter to be developed by Hitachi. It incorporates everything Hitachi knows about High-performance racing starters. From the 6:1 gear reduction to the permanent magnet-coaxial design, nothing out there tops it. Amazingly Hitachi has packed all this technology into what is the lightest starter on the market. The Hitachi Pro Super-Lite starters weigh an incredible 7A pounds, making them the lightest starters available. Another class leading feature is 360A multi-clocking on all Hitachi Pro Super-Lite mounting blocks, and included ARP high tensile bolts. When you want to have the best of both worlds, you want the Hitachi Dominator Starter. With 1.9 "true" HP, this starter will handle just about everything you throw at it. Along with Hitachias full ball bearing construction you get 3:7 gear reduction in a package that is still 33% lighter than your OEM starter. Multi-clocking is available with all Hitachi Pro Plus Racing Starters. When you want to have the best, you need the Hitachi Intimidator Starter. Pushing out 2.68 "real" HP, this baby will turn over anything in its way. From a 13:1 big-block to your wildest 18:1 alcohol burner, nothing cranks like Hitachi Pro Extreme Starters. 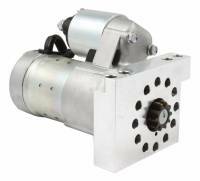 With multi-clocking and 3:73 gear reduction, you will have bought the last starter you'll ever need. We feature Hitachi Pro Racing Starters at low everyday prices!